A funny quirk on this slot is the Boxing Feature, which can cause two boxers to suddenly appear on the reels and start fighting each other. If one of them get in a really good hit, the opponent can be pushed to another spot and turn that spot wild. Highest win on Fisticuff is a 100,000 coins which means €100,000 if you are playing with the highest possible coin value. 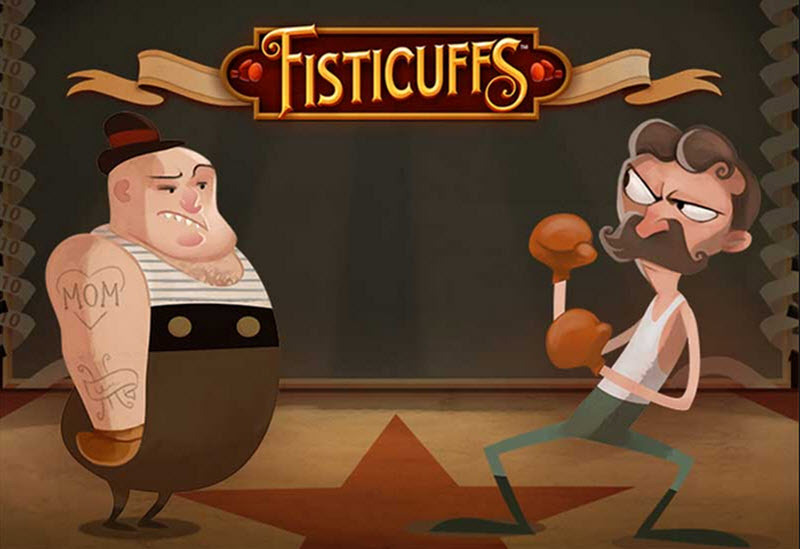 We enjoyed playing Fisticuffs, partly because of the great athmosphere with the old-fashioned carnival feeling and the festive music. Even though this slot only have 10 paylines, you always have to bet at least 20 coins which is a bit strange and unusual. It is marketed as a win-both-ways game, but you will have to wager an extra coin per payline to get that benefit and its not optional. You can adjust the coin value. Lowest possible coin value is €0.01 and highest possible is €1. The theme is fistfights. 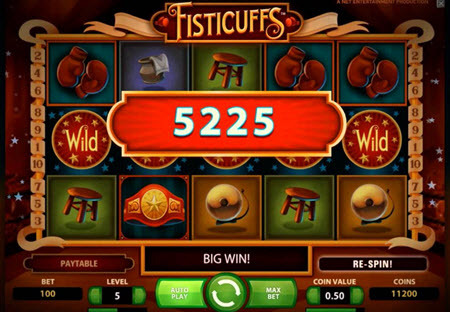 Examples of items that can appear on the reels are boxing shoes, belts, the bell, and trophies. Two fighters can also make an appearance; one lightweight and one heavy-weight. The heavy-weight fighter is a Straight Wild. The lightweight fighter is a Diagonal Wild. In addition to just being wilds, they can trigger the boxing feature. If the boxing feature is triggered, the two wild symbols will start fighting each other on the reels. The heavy-weight fighters, which is a Straight Wild, can only show up on the third reel. If you get him on the third reel AND also get the lightweight fighter anywhere next to him on reel two or four, the heavy-weight guy will hit the little guy, pushing him away to the first or fifth reel, making a new spot wild. You will also be awarded with a re-spin and all the wilds will stay in place to help you during that re-spin. There is also nother possible scenario: If the little guy appears diagonally from the heavy guy, a fight will ensue that makes the spot below or above the heavy fighter to turn wild. You will also get a re-spin with the wilds frozen in place.